The Gattefossé Foundation has awarded three establishments with a prize and two grants, following its call for applications 2018. On October 16, 2018, the prize (10 000€) was awarded to Dr. Anne Moro’s team (University Hospital of La Réunion) at the Foundation’s headquarters in Lyon (France). Anne Moro has a degree in clinical aromatherapy from the University of Strasbourg. She coordonates the MAFACE expertise center in La Réunion for the treatment of facial malformations and cleft lip and palate. 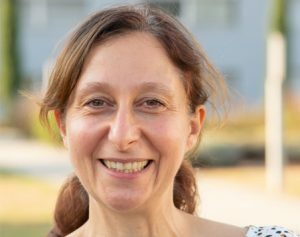 For the past 3 years, she has been using essential oils at the University Hospital of La Réunion to improve the healing of wounds and scars, prevent infections and calm the pain and stress of her patients. Anne Moro also contributes to a more general use of aromatherapy in the hospital: at the pharmacy, in the operating room and within the voluntary services. A PHRI* (hospital research nurse program) is underway for a research project that should begin in December 2018. With the association TSIKY RUN, she uses essential oils during humanitarian missions in Madagascar. The aim of the association is, on one hand, to support patients born with a cleft lip and palate (harelip) and to treat pre and post operative care with essential oils. On the other hand she trains Malagasy doctors in the use of essential oils, as a complementary care strategy or sometimes as a replacement to allopathic treatments. These missions are supported by the University Hospital of La Réunion, which grants leave to its employees who take part in humanitarian missions and lends surgical equipment as well. The Steering Committee on Aromatherapy has rewarded the innovative nature of the use of essential oils in pediatrics, particularly in repair surgery of the cleft lip and palate and in the operating room. Besides, the location of the project in a country that distills oils, the humanitarian nature of missions in Madagascar facilitating access to care for disadvantaged families and the quality of the protocols put in place were particularly emphasized. 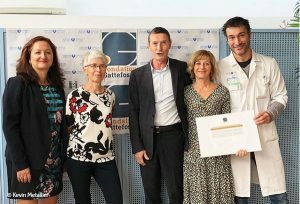 On October 9, 2018, the Foundation Grant (5 000€) was awarded to the team of Marin Hospital of Hendaye (Hôpital Marin de Hendaye / Assistance Publique – Hôpitaux de Paris). Mr Andoni Alli, hospital pharmacist, is in charge of the aromatherapy approach. Trained at the Dijon DU, he initiated this approach in 2013. This rehabilitation and recuperative care facility uses aromatherapy as complementary medicine in the treatment of wounds, mycoses, gastrointestinal disorders, herpes, agitation, anxiety, insomnia, spasticity and pain in patients with heavy disabilities or rare neurological and endocrine diseases. The Steering Committee on Aromatherapy has rewarded the innovative nature of the use of oils in this type of establishment, the diversity of pathologies and areas of intervention, the internal dynamics initiated by the involvement of the pharmacist and the director of health, the training of a hundred people and the designation of aromatherapy referents in each department concerned, as well as the validation of protocols by the department of care and the doctors of the poles. On October 12, 2018, the Foundation Grant was awarded to the team of the Barthélemy Durand Public Health Institution (EPS) in Etampes (Essonne, France), which aromatherapy approach is carried by Mrs. Ioana Farcas, hospital pharmacist, trained in IUD Phyto-aroma of Paris V University. The Steering Committee on Aromatherapy has rewarded the innovative nature of the use of essential oils in the services of this reference institution in mental health since 2015, the supervision of the use of essential oils by a team of pharmacists, and the willingness to set up a scientific aromatherapy program with staff training and evaluation of the decline in chemical drug intake. The Committe also appreciated the engaging awareness and communication measures about aromatherapy and the inclusion of the development of the use of essential oils in the establishment project, within a global development of the non-medicated therapies.